This material must be preceded or accompanied by a current prospectus (or summary prospectus, if available) for the MML Series Investment Fund II. Investors should consider a Fund’s investment objective, risks, and charges and expenses carefully before investing. This and other information about the investment company is available in the prospectus (or summary prospectus, if available). Read it carefully before investing. 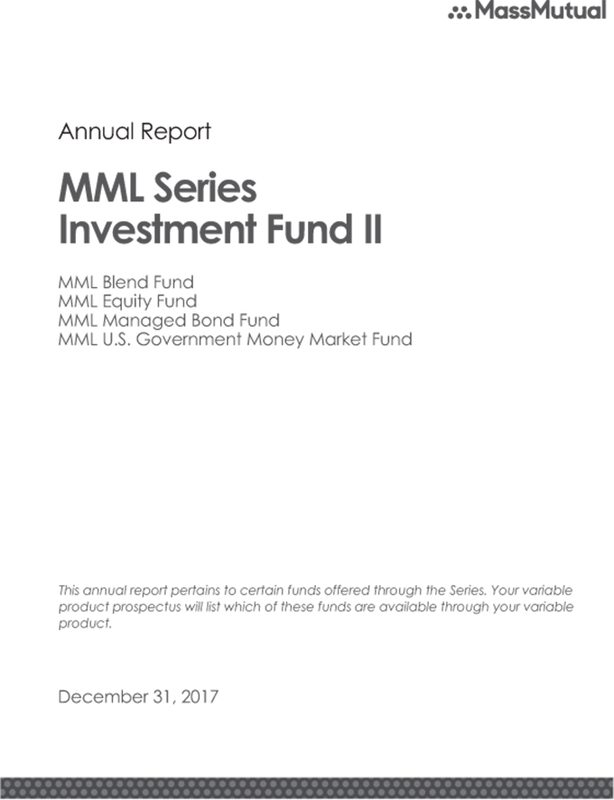 I am pleased to present you with the MML Series Investment Fund II Annual Report, covering the year ended December 31, 2017 (the “fiscal year”). Domestic stocks enjoyed strong performance during the fiscal year, as investor sentiment was buoyed by campaign promises focused on tax reforms, infrastructure spending, health care reform, and the creation of American jobs. One campaign promise fulfilled was the passage of tax reform, as President Trump signed sweeping tax legislation (i.e., the Tax Cuts and Jobs Act) into law on December 22, 2017. Foreign stocks also performed well for investors, as European markets stabilized significantly with Brexit concerns shifting to the actual details of executing Great Britain’s separation from the European Union. Asian markets also stabilized, even though geopolitical tensions in the region escalated due to China’s disputed expansion in the South China Sea, North Korea’s increased nuclear and missile arsenal, and lingering suspicions regarding Russia’s covert involvement in the American political process and its participation in Middle Eastern conflicts. Japan’s economic policies also appeared to be helping that country overcome its long-term economic challenges. While equity markets added to an impressive string of consecutive quarters with positive results, investment-grade bond investors found it more difficult to generate satisfying returns during the period. In MassMutual’s view, the ongoing uncertainties associated with investing in today’s markets validate the importance of taking a long-term perspective and not reacting to current events or short-term market changes. We also believe investors preparing for retirement who follow certain investment guidelines, such as the ones below, may increase their chances of reaching their long-term income retirement goals. Many seasoned investors believe that retirement savers who can tolerate a market downturn have the potential to be rewarded by accumulating larger positions at more favorable prices (compared to those who do not invest during a down market). That’s why financial professionals often advise their clients to stay in the market, regardless of short-term results. For most, saving and investing for retirement occurs over many decades. While most retirement investors may be familiar with market volatility, savvy investors know that adopting a long-term view of the markets can help them withstand all market conditions. * Systematic investing and asset allocation do not ensure a profit or protect against loss in a declining market. Systematic investing involves continuous investment in securities regardless of fluctuating price levels. Investors should consider their ability to continue investing through periods of low price levels. Stocks, bonds, and short-term/money market investments typically (although not always) behave differently, depending on the economic and market environment. Each of these asset classes contains an even greater array of sub-categories, such as small-cap stocks, international stocks, and high-yield bonds. Many financial professionals believe that investors can take advantage of different opportunities in the market and reduce the risk of over-exposure to one or two poorly performing investment types by maintaining retirement accounts that contain a mix of investment types and sub-categories. Many financial advisors suggest that retirement investors select an appropriate combination of investments that aligns with their retirement income goals. Doing so can help you withstand the inevitable ups and downs of the markets. • feel you are taking the right steps to help reduce your longevity risk, which is related to the possibility that you could “outlive” your retirement savings. MassMutual believes that nothing matters more than people. Our commitment has always been to help you care for the people you care about. We’ve helped people secure their future and protect the ones they love since 1851. And that’s why we consistently encourage retirement investors to maintain a long-term view toward retirement investing, and avoid reacting to short-term market movements. We believe that ever-changing market conditions have the potential to benefit people who maintain a long-term perspective on investing. Thank you for your continued confidence in MassMutual. The information provided is the opinion of MML Investment Advisers, LLC as of 1/1/18 and is subject to change without notice. It is not to be construed as tax, legal, or investment advice. Of course, past performance does not guarantee future results. • U.S. stock investors enjoyed strong performance during the fiscal year, bolstered by a rally which started after the November 2016 U.S. presidential election. • Data throughout the period pointed to sustained improvements in the global economic environment. • Foreign markets rebounded over the past 12 months, even though geopolitical turbulence increased in some regions. • The Federal Reserve Board (the “Fed”) raised short-term interest rates three times during the reporting period and introduced a plan to shrink its balance sheet, beginning in 2017. • Investment-grade bond investors saw the smallest returns during this annual reporting cycle. U.S. stock investors enjoyed strong performance during the fiscal year ended December 31, 2017, bolstered by a rally which started after the November 2016 U.S. presidential election. All major domestic stock indexes registered positive returns during the period, though returns varied widely across asset classes and investment types. Following the surprising election of Donald J. Trump as the 45th President of the United States, investor sentiment was buoyed by campaign promises focused on tax reforms, infrastructure spending, health care reform, and the creation of American jobs. While the Trump administration and the Republican-led Congress struggled, for a good bit of the year, to turn campaign promises into policy realities, investor sentiment remained high through the end of the reporting period. One campaign promise that the President was able to fulfill, however, was the passage of tax reform (i.e., the Tax Cuts and Jobs Act), which he signed into law on December 22, 2017. Consecutive improved quarterly earnings reports fueled strong investor sentiment. For each quarterly reporting cycle of this fiscal year, the majority of American corporations reported earnings and sales that beat forecasts. (This, despite the fact that many companies cited the impact of hurricanes and high foreign exchange rates as negatively impacting earnings or revenue in the third quarter.) While the market generally acknowledges that stock valuations are high by historical standards, strong earnings and sales results appear to justify ongoing investor participation in equity markets. Continued improving domestic economic data also supported investor confidence over the past 12 months. In 2017, the scope of improved economic data expanded to include developed international markets. European markets stabilized significantly as Brexit concerns shifted to the actual details of executing Great Britain’s separation from the European Union (EU). Prime Minister Teresa May triggered Article 50 of the Lisbon Treaty (which outlines the process for EU members to withdraw from the EU) on March 29, 2017 – setting the time frame for Britain to officially leave the EU as no later than April 2019. Continued German economic strength, bolstered by Angela Merkel’s re-election in September 2017, added stability to EU and global markets. Emmanuel Macron’s resounding victory in France’s May 2017 presidential election seemed to stem the populist political tide that had added turbulence to EU markets. Asian markets also stabilized, even though geopolitical tensions in the region escalated due to China’s disputed expansion in the South China Sea, North Korea’s increased nuclear and missile arsenal, and lingering suspicions regarding Russia’s covert involvement in the American political process and its participation in Middle Eastern conflicts. China’s central bank managed to successfully navigate concerns about production declines, real estate, currency pricing, and the growing Chinese middle class. Japan’s economic policies also appeared to be helping that country overcome its long-term economic challenges. selection of Jerome Powell as the next Fed chair following current chair Janet Yellen’s term. The selection, which was largely anticipated, is expected to be supportive of markets. As noted earlier, the Fed’s impact on the markets in 2017 was relatively muted compared to recent years, when the mere threat of a rate hike added turbulence to markets. During this reporting period, Fed actions did not negatively disrupt markets. During the one-year period ended December 31, 2017, the technology-focused NASDAQ Composite® Index rose 29.64%, the S&P 500® Index (S&P 500) of large-capitalization U.S. stocks gained 21.83%, the Dow Jones Industrial AverageSM grew 28.11%, and the Russell 2000® Index of small-capitalization stocks added 14.65%. Notably, this marks the second consecutive year these indexes logged double-digit returns. Domestic large-cap growth stocks outperformed other domestic indexes for the reporting period, as the Russell 1000® Growth Index reported a remarkable 30.21% return. Investment-grade bond investors were once again left largely on the sidelines, as the Bloomberg Barclays U.S. Aggregate Bond Index, a broad measure of the U.S. investment-grade bond markets, advanced only 3.54% for the period. Market yields generally accelerated following last November’s U.S. presidential election. Since bond prices typically fall during periods of rising interest rates, this was a particularly challenging time for the bond market. With nine consecutive quarters of positive returns for the S&P 500 now in the history books, thoughtful investors are asking themselves how long this upward climb can continue. We remain convinced that a broadly diversified portfolio aligned to a long-term strategy is, for those investors seeking retirement income, the wisest course. When one side of the market enjoys outsized growth for a long period of time, portfolios may become overweight in one asset class. Consequently, as we close out this fiscal year, you may find that this is the right time to evaluate your portfolio to ensure that it matches your overall risk tolerance, investment strategy and objectives. * Indexes are unmanaged, do not incur fees or expenses, and cannot be purchased directly for investment. What is the investment approach of MML Blend Fund, and who is the Fund’s subadviser? The Fund seeks to achieve as high a level of total rate of return over an extended period of time as is considered consistent with prudent investment risk and the preservation of capital. The Fund invests across different asset classes (equity securities, fixed income securities, including bank loans and Rule 144A securities, and money market instruments), each represented by a different segment of the Fund’s portfolio. The subadviser typically adjusts the allocation among the three segments, based on its judgment about each segment’s potential for returns in comparison with those of other segments and corresponding risk. The Fund’s subadviser is Barings LLC (Barings). How did the Fund perform during the 12 months ended December 31, 2017? The Fund’s Initial Class shares returned 15.25%, significantly underperforming the 21.83% return of the S&P 500® Index (the “stock component’s benchmark”), which measures the performance of 500 widely held stocks in the U.S. equity market. The Fund outperformed, by a wide margin, the 3.54% return of the Bloomberg Barclays U.S. Aggregate Bond Index (the “bond component’s benchmark”), which measures the performance of the investment grade, U.S. dollar-denominated, fixed-rate taxable bond market, including Treasuries, government-related and corporate securities, mortgage-backed securities (MBS) (agency fixed-rate and hybrid ARM pass-throughs), asset-backed securities (ABS), and commercial mortgage-backed securities. The Fund outperformed the 14.10% return of the Lipper Balanced Fund Index, an unmanaged, equally weighted index of the 30 largest mutual funds within the Lipper Balanced Category. Finally, the Fund outperformed the 14.26% return of the Custom Balanced Index (the “blend benchmark”), which comprises the stock component’s benchmark and the bond component’s benchmark. The weightings of each index are 60% and 40%, respectively. For a discussion on the economic and market environment during the 12-month period ended December 31, 2017, please see the Economic and Market Overview, beginning on page 3. For the year ended December 31, 2017, the Fund had a substantial portion of its portfolio invested in equities, which rose over 21% in 2017. Within the equity investments in the Fund, a lower-than-benchmark allocation to strong-performing large-cap growth stocks, such as Amazon, detracted from the Fund’s relative performance during the year, since growth stocks outperformed their value counterparts by 16.5% in 2017. The companies that have been growing their earnings and revenues the most had the highest return in 2017. Often investors will favor value-oriented companies when the economy is accelerating, as they generally benefit from cyclical growth; in 2017, however, that was not the case. Instead, investors clamored to own companies that were growing rapidly, and many of these companies were beneficiaries of the use of data and artificial intelligence. Generally, these companies underperformed in 2016, so some of the 2017 gains were catch-up, but certainly not all. We believe the rest has been a realization by investors that these companies are extremely profitable, earning high margins – and may be able to maintain those growth levels for longer than many had previously believed. For example, Alphabet, the parent company of well-known web search company Google, collects massive amounts of data each day and makes the bulk of their money by selling that data. Alphabet rose over 32% in 2017, and their earnings are estimated to have risen over 16% in 2017. (The company’s share price rose only 1.8% in 2016, even as their earnings grew 22%.) On the opposite end of the spectrum, companies that pay high dividends generally underperformed the rest of the market, as investors have begun to question how much should be paid for these slow-growing companies. In the Fund’s fixed-income investments, the Fund was more invested in corporate bonds than was the bond component’s benchmark, and this helped performance. (Corporate bonds often have performance that more similarly resembles equity performance, rather than bond performance.) The Fund was also able to successfully navigate between 30- and 15-year mortgages over the period, based on relative value pricing, proving that positive performance contributions can be found even in challenging periods. The Fund is permitted to use derivative instruments. Derivatives are securities that derive their value from the performance of one or more other investments and take the form of a contract between two or more parties. The equity portion of the Fund did not use derivatives during the year. The fixed-income component uses derivative instruments for yield curve, duration, downside hedging and to gain exposures. They may also be used as a substitute as a direct investment. In aggregate, these positions detracted from performance for the year. Looking to 2018, we continue to favor equities, as the fundamental reason for their higher than normal margins has not changed. Companies have had lower growth in wage cost due to the globalization of labor markets and the move to automation. These trends are in place, and we don’t see them changing dramatically in 2018. As for the high-growth companies, we remember a similar run by the internet companies in the late 1990s. We believe there are fundamental differences now because the current crop of big growers is making a tremendous amount of money. Valuation does ultimately matter, though, so our view is that these companies will need to continue to grow rapidly to support their high valuations. Some will not be able to, but the Fund is invested in some that Fund management believes will. Hypothetical Investments in MML Blend Fund Initial Class, the S&P 500 Index, the Bloomberg Barclays U.S. 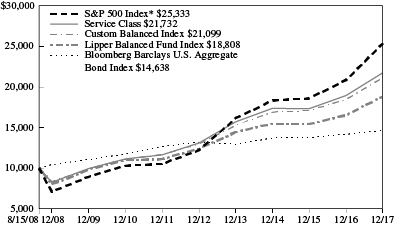 Aggregate Bond Index, the Lipper Balanced Fund Index, and the Custom Balanced Index. Hypothetical Investments in MML Blend Fund Service Class, the S&P 500 Index, the Bloomberg Barclays U.S. 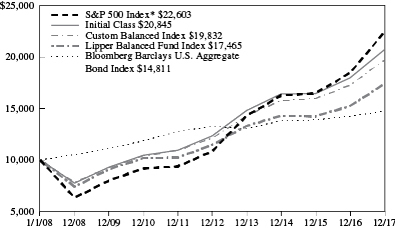 Aggregate Bond Index, the Lipper Balanced Fund Index, and the Custom Balanced Index. Generally accepted accounting principles require adjustments to be made to the net assets of the Fund at period end for financial reporting purposes only, and as such, the total return based on the unadjusted net asset value per share may differ from the total return reported in the financial highlights. Performance data quoted represents past performance; past performance is not predictive of future results. The investment return and principal value of shares of the Fund will fluctuate with market conditions so that shares of the Fund, when redeemed, may be worth more or less than their original cost. Current performance of the Fund may be lower or higher than the performance quoted. Performance data current to the most recent month end may be obtained by accessing the website at www.massmutual.com. Investors should note that the Fund is a professionally managed mutual fund, while the S&P 500 Index, the Bloomberg Barclays U.S. Aggregate Bond Index, the Lipper Balanced Fund Index, and the Custom Balanced Index are unmanaged, do not incur expenses, and cannot be purchased directly by investors. Investors should read the Fund’s prospectus with regard to the Fund’s investment objective, risks, and charges and expenses in conjunction with these financial statements. The Fund’s return reflects changes in the net asset value per share without the deduction of any product charges (e.g., cost of insurance, mortality and expense risk charges, administrative fees, and CDSL). The inclusion of these charges would have reduced the performance shown here. What is the investment approach of MML Equity Fund, and who are the Fund’s subadvisers? The Fund’s primary objective is to achieve a superior total rate of return over an extended period of time from both capital appreciation and current income. Its secondary objective is the preservation of capital when business and economic conditions indicate that investing for defensive purposes is appropriate. The Fund invests primarily in common stocks of companies that the subadvisers believe are undervalued in the marketplace, with a focus on securities of larger size companies. Under normal circumstances, the Fund invests at least 80% of its net assets (plus the amount of any borrowings for investment purposes) in common stocks, preferred stocks, securities convertible into common or preferred stocks, and other securities, such as warrants and stock rights, whose value is based on stock prices. The Fund typically invests most of its assets in securities of U.S. companies, but may invest up to 25% of its total assets in foreign securities and American Depositary Receipts (“ADRs”), including developed and emerging market securities. The Fund may invest up to 10% of its net assets in debt securities. The Fund’s two subadvisers are OppenheimerFunds, Inc. (OFI), which managed approximately 59% of the Fund’s portfolio; and Brandywine Global Investment Management, LLC (Brandywine Global), which was responsible for approximately 41% of the Fund’s portfolio, as of December 31, 2017. Effective December 4, 2017, Brandywine Global replaced Loomis, Sayles & Company, L.P. (Loomis Sayles) as a co-subadviser of the MML Equity Fund. The Fund’s Initial Class shares returned 15.79%, outperforming the 13.66% return of the Russell 1000® Value Index (the “benchmark”), which measures the performance of the large-cap value segment of U.S. equity securities. It includes the Russell 1000 Index companies with lower price-to-book ratios and lower expected growth values. It is market-capitalization weighted. For the time that Loomis Sayles served as co-subadviser for the Fund (January 1 – December 3, 2017), the Fund component holdings that contributed most to performance were Bank of America and JPMorgan Chase. Solid earnings results plus various positive developments on the deregulation front served as positive catalysts for stocks within the financials sector, as did the beneficial outlook for these shares due to the prospects of tax reform passage. Two Fund component holdings detracted the most from full-year returns: Advance Auto Parts and Anadarko Petroleum. Shares of Advance Auto Parts came under severe pressure throughout the year, due to the combination of elevated expectations and industry deceleration. Anadarko underperformed in the wake of the Colorado home explosion that originated from a gas leak in a nearby well. While it is unclear who will ultimately be deemed responsible for the explosion, Anadarko, as the owner of the well at the time of the tragedy, saw its share price decline. For the time that Brandywine Global served as co-subadviser for the Fund (December 4 – December 31, 2017), many of this Fund component’s lowest-momentum energy holdings performed extraordinarily well, as the price of crude oil moved markedly higher. This Fund component’s underweight allocation, relative to the benchmark, to the utilities sector (the worst-performing sector in December by a wide margin) benefited performance. Fund component holdings in the energy and technology sectors hindered performance. With respect to the OFI portion of the Fund, the top-performing Fund component holdings were in the financials sector, including Bank of America and JPMorgan Chase. The financials sector in general performed well in 2017, as investors became more optimistic about tax reform, which they viewed could positively impact banks. Bank of America and JPMorgan were both beneficiaries of the rally in financial stocks. Another top contributor was XPO Logistics, Inc. Shares of this Fund component holding, a vertically integrated logistics company providing both freight brokerage and trucking services, advanced strongly – due to solid margin improvement after integrating the 2015 acquisition of trucking company Con-Way. Top detractors from performance included energy Fund component holdings Hess Corporation (an American global energy company engaged in the exploration and production of crude oil and natural gas) and Weatherford International plc, one of the largest multinational oilfield service companies. Financial stock Synchrony Financial was another Fund component holding that detracted from results. Synchrony Financial, which provides private label credit cards to merchants, declined after reporting financial results that fell short of expectations. OFI eliminated the position from its portfolio. In the view of Brandywine Global, the economy remains quite strong as we head into 2018. Our bottom-up sector weighting remains more pro-cyclical and positively exposed to higher interest rates. At year end, our Fund component held overweight positions in consumer discretionary, technology, and banks and insurance companies within the finance sector, as well as large underweights in higher-yielding utilities and real estate companies. In our view, changes in tax policy have the potential to continue to benefit our Fund component holdings in the industrials, consumer discretionary and financial sectors, particularly if tax reform ultimately contributes to higher economic growth than expected. OFI observes that 2017 was characterized by improving global economic activity. As bottom-up value investors, we believe there are attractively valued stocks that can benefit from these positive trends. While many investors focus on a short-term view when considering potential investments, we use in-depth fundamental research to identify companies that could be poised for an unanticipated acceleration in return on invested capital over a multi-year time horizon. 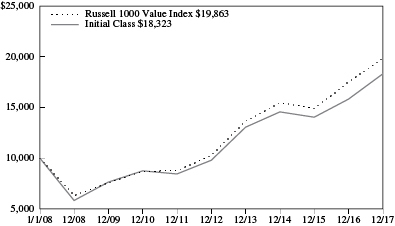 Hypothetical Investments in MML Equity Fund Initial Class and the Russell 1000 Value Index. 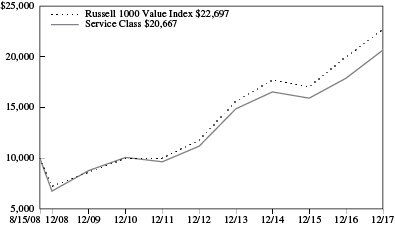 Hypothetical Investments in MML Equity Fund Service Class and the Russell 1000 Value Index. Investors should note that the Fund is a professionally managed mutual fund, while the Russell 1000 Value Index is unmanaged, does not incur expenses, and cannot be purchased directly by investors. Investors should read the Fund’s prospectus with regard to the Fund’s investment objective, risks, and charges and expenses in conjunction with these financial statements. The Fund’s return reflects changes in the net asset value per share without the deduction of any product charges (e.g., cost of insurance, mortality and expense risk charges, administrative fees, and CDSL). The inclusion of these charges would have reduced the performance shown here. What is the investment approach of MML Managed Bond Fund, and who is the Fund’s subadviser? The Fund’s investment objective is to achieve as high a total rate of return on an annual basis as is considered consistent with the preservation of capital. Under normal circumstances, the Fund invests at least 80% of its net assets (plus the amount of any borrowings for investment purposes) in investment grade fixed income securities (rated Baa3 or higher by Moody’s, BBB- or higher by Standard & Poor’s or the equivalent by any NRSRO, or, if unrated, determined to be of comparable quality by the subadviser). The Fund’s subadviser is Barings LLC (Barings). The Fund’s Initial Class shares returned 4.69%, outperforming the 3.54% return of the Bloomberg Barclays U.S. Aggregate Bond Index (the “benchmark”), which measures the performance of the investment grade, U.S. dollar-denominated, fixed-rate taxable bond market, including Treasuries, government-related and corporate securities, MBS (agency fixed-rate and hybrid ARM pass-throughs), ABS, and CMBS. For the year ended December 31, 2017, the Fund’s overweight allocation, relative to the benchmark, to investment-grade corporate bonds was a positive contributor to performance. Security selection within the banking sector benefited full-year returns, despite the Fund being slightly underweight in this sector. The Fund’s exposure to the insurance sector also contributed positively to performance, as insurers continued to improve their earnings and capital positions. An overweight to asset-backed securities (ABS) sector was the primary positive contributor within the securitized sector, with holdings concentrated in government-guaranteed FFELP (Federal Family Education Loan Program) student loans. Once rating review and action was taken by the Nationally Recognized Statistical Rating Organizations early in 2017, prices on these securities recovered. Agency mortgage-backed securities (MBS) also contributed to performance. (“Agency” refers to government-sponsored entities that issue bonds backed by mortgage loans, including Ginnie Mae, Fannie Mae, Freddie Mac, and the Federal Home Loan Banks.) The Fund held an underweight stake in this sector, on average, as it has provided relatively low returns. Tactical positioning in lower-coupon securities during the beginning of the period and rotating into higher coupons later helped performance. The Fund was also able to successfully navigate between 30- and 15-year mortgages over the period, based on relative value pricing, proving that positive performance contributions can be found even in challenging periods. Fund holdings within the integrated oil sector detracted from performance. Within energy, the Fund was positioned in the pipeline and drilling sub-sectors, as those companies are diversified and less sensitive to the spot price of oil. Taxable municipal bonds also hampered performance. The Fund managed to avoid headline names in the municipal market, but overall sector performance lagged relative to the benchmark, as late in the year many of those troubled headline names rallied amid strong economic conditions. The Fund uses derivative instruments – securities that derive their value from the performance of one or more other investments and take the form of a contract between two or more parties – for yield curve, duration, downside hedging and to gain exposures. They may also be used as a substitute for a direct investment. In aggregate, these positions detracted from performance over the year. Our view is that global growth prospects remain relatively sound. This has pushed short-maturity government bond yields higher, as market participants have begun to reappraise future monetary policy expectations. Longer-dated maturity yields have fallen – reflecting the current benign inflation environment. Risk assets have performed well, suggesting that investors are increasingly taking note of a period of stronger, synchronized global growth. As we move into 2018, the Fund is focusing on yield opportunities away from Treasury and government bonds. In our view, ABS is attractive, relative to other shorter-duration fixed-income asset classes. The natural liquidity profile from monthly principal paydowns provides a frequent source of income. We believe that corporate fundamentals, though still stretched, are improving, and could continue with a tailwind from a weaker U.S. dollar and tax reform-fueled stronger earnings. For now, economic and market volatility remains subdued, but we believe it could tick upward as global central banks become more hawkish, suggesting that “credit picking” could continue to trump sector rotation strategies. 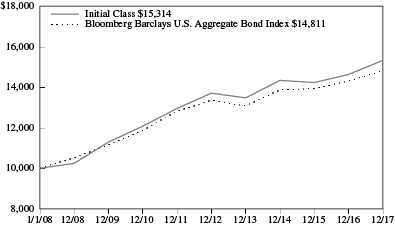 Hypothetical Investments in MML Managed Bond Fund Initial Class and the Bloomberg Barclays U.S. Aggregate Bond Index. 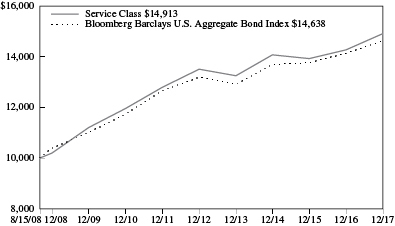 Hypothetical Investments in MML Managed Bond Fund Service Class and the Bloomberg Barclays U.S. Aggregate Bond Index. Investors should note that the Fund is a professionally managed mutual fund, while the Bloomberg Barclays U.S. Aggregate Bond Index is unmanaged, does not incur expenses, and cannot be purchased directly by investors. Investors should read the Fund’s prospectus with regard to the Fund’s investment objective, risks, and charges and expenses in conjunction with these financial statements. The Fund’s return reflects changes in the net asset value per share without the deduction of any product charges (e.g., cost of insurance, mortality and expense risk charges, administrative fees, and CDSL). The inclusion of these charges would have reduced the performance shown here. What is the investment approach of MML U.S. Government Money Market Fund, and who is the Fund’s subadviser? The Fund’s investment objective is to achieve current income consistent with preservation of capital and liquidity. The Fund normally invests at least 99.5% of its total assets in cash, U.S. Government securities, and/or repurchase agreements fully collateralized by cash or U.S. Government securities. It is important to note that this Fund seeks to maintain, but does not guarantee, a stable $1.00 share price. Under normal circumstances, the Fund invests at least 80% of its net assets in U.S. Government securities and repurchase agreements that are fully collateralized by U.S. Government securities. You could lose money by investing in the Fund. Although the Fund seeks to preserve the value of your investment at $1.00 per share, it cannot guarantee it will do so. An investment in the Fund is not insured or guaranteed by the Federal Deposit Insurance Corporation or any other government agency. The Fund’s sponsor has no legal obligation to provide financial support to the Fund, and you should not expect that the sponsor will provide financial support to the Fund at any time. The Fund’s subadviser is Barings LLC (Barings). The Fund’s Initial Class shares returned 0.36%, underperforming the 0.84% return of the Citigroup 3-Month Treasury Bill Index (the “benchmark”), which measures the performance of the last three three-month Treasury bill month-end rates. Short-term interest rates have started to move off their historical lows, as monetary policy ever so slowly starts to tighten. LIBOR (London Interbank Offered Rate) rates increased over the last year, due to Federal Reserve (the “Fed”) rate hikes in March, June and December of 2017. One-month LIBOR has increased 0.73% to 1.50% over the year and three-month LIBOR increased 0.63% to 1.63% over the 12-month period. In 2016, the Fund converted to a government-only fund from a prime fund. The Fund consists of United States government securities or those issued by one of the U.S. government agencies. The Fund bought a large amount of adjustable rate agency paper in order to maximize yield while keeping the Weighted Average Maturity (WAM) at a manageable level. These adjustable rate issues continued to provide an attractive yield advantage for the Fund, as the Fed raised rates three times in 2017, sending LIBOR higher. The Fund does have some exposure to longer-dated fixed-maturity agency paper. (“Agency” refers to debt issued by U.S. federal government agencies or government-sponsored entities for financing purposes.) Almost all of that paper matures in the first quarter of 2018. These instruments trade slightly cheaper than U.S. Treasury bills. The Fund underperformed its benchmark due to shortening of WAM during the period. The WAM of the Fund dropped quite a bit in 2017, but the Weighted Average Life (WAL), which takes into account a bond’s final maturity date, has not dropped nearly as much. Much of the drop in WAM can be attributed to many more one-month agency adjustable rate issues (instead of three-month issues) being purchased in 2017, as the Fund tried to capitalize on the flattening between the one-month and three-month LIBOR curve. The other component of the drop in WAM has been the Fund’s desire to keep fixed rate purchases short of, or right around, any Fed meeting that might be in play. In the last 12 months, we have seen the Fed hike rates three times. The decrease in WAM has allowed the Fund to react quickly to changing market conditions and to maintain its commitment to the objectives of stability and liquidity. In addition to WAM shortening, fund expenses also contributed to under performance compared to the benchmark. In our view, global growth prospects remain relatively sound. This has pushed short government bond yields and LIBOR higher, as market participants have begun to reappraise future monetary policy expectations across both domestic and international markets. Risk assets have performed well, suggesting that investors are looking at better global growth prospects. more interest rate hikes could materialize in 2018. As a way to protect against these future hikes, the Fund will continue to purchase adjustable rate paper and short fixed rate paper. 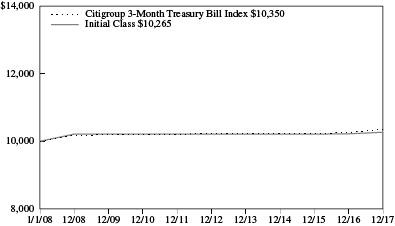 Hypothetical Investments in MML U.S. Government Money Market Fund Initial Class and the Citigroup 3-Month Treasury Bill Index. Investors should note that the Fund is a professionally managed mutual fund, while the Citigroup 3-Month Treasury Bill Index is unmanaged, does not incur expenses, and cannot be purchased directly by investors. Investors should read the Fund’s prospectus with regard to the Fund’s investment objective, risks, and charges and expenses in conjunction with these financial statements. The Fund’s return reflects changes in the net asset value per share without the deduction of any product charges (e.g., cost of insurance, mortality and expense risk charges, administrative fees, and CDSL). The inclusion of these charges would have reduced the performance shown here. An investment in the MML U.S. Government Money Market Fund is not insured or guaranteed by the Federal Deposit Insurance Corporation or any other government agency. Although the Fund seeks to maintain a stable net asset value per share, it is possible to lose money by investing in the Fund. Tesoro Logistics LP/Tesoro Logistics Finance Corp.
(b) Securities exempt from registration under rule 144A of the Securities Act of 1933. These securities may be resold in transactions exempt from registration, normally to qualified institutional buyers. At December 31, 2017, these securities amounted to a value of $86,581,990 or 12.45% of net assets. (c) Certain variable rate securities are not based on a published reference rate and spread but are determined by the issuer or agent and are based on current market conditions. These securities do not indicate a reference rate and spread in their description above. The rates shown are the current interest rates at December 31, 2017. (d) Investment was valued using significant unobservable inputs. (e) This security is fair valued in good faith in accordance with procedures approved by the Board of Trustees. At December 31, 2017, these securities amounted to a value of $1,055,741 or 0.15% of net assets. (f) Restricted security. Certain securities are restricted as to resale. At December 31, 2017, these securities amounted to a value of $1,361,728 or 0.20% of net assets. The Fund generally bears the costs, if any, associated with the disposition of restricted securities. (g) A portion of this security is purchased on a when-issued, delayed-delivery or forward commitment basis. (Note 2). (h) A portion of this security is pledged/held as collateral for open futures contracts. (Note 2). (i) Maturity value of $400,834. Collateralized by U.S. Government Agency obligations with a rate of 2.750%, maturity date of 2/15/24, and an aggregate market value, including accrued interest, of $413,955. (j) See Note 6 for aggregate cost for federal tax purposes. * Contracts are subject to a Master Netting Agreement. † Payment is based on a percentage of the index. Reference entities are a number of individual issuers comprising the index. †† For each credit derivative with sold protection, the credit ratings of the entities referenced, as rated by any rating organization, are included in the equivalent S&P Global Ratings. The reference entity rating represents the likelihood of a potential payment by the Fund if the referenced entity experiences a credit event as of period end. Notional amounts represent the maximum potential amount of future payments (undiscounted) the Fund could be required to make under the credit derivatives with sold protection. (b) Denotes all or a portion of security on loan. The total value of securities on loan as of December 31, 2017, was $19,709,581 or 2.27% of net assets. Total securities on loan may not correspond with the amounts identified in the Portfolio of Investments because pending sales may be in the process of recall from the brokers. (Note 2). (d) Maturity value of $10,361,970. Collateralized by U.S. Government Agency obligations with rates ranging from 2.000% – 2.750%, maturity dates ranging from 2/15/24 – 4/30/24, and an aggregate market value, including accrued interest, of $10,571,498. (e) See Note 6 for aggregate cost for federal tax purposes.